With the presence of a large pool of participants, the global algae biofuel market is displaying a highly competitive business landscape, finds a new research report by Zion Market Research (ZMR). Algenol, Blue Marble Production, Culture Biosystems, Sapphire Energy Origin Oils Incorporation, Proviron, Culture Biosystems Genifuels, Algae Systems, Solix Biofuels, Solazyme Incorporation, and Reliance Life Sciences are some of the key vendors of algae biofuel across the world. These players are focusing aggressively on innovation, as well as on including advanced technologies in their existing products. Over the coming years, they are also expected to take up partnerships and mergers and acquisitions as their key strategy for business development, states the algae biofuel market study. Citing a recent instance, University of Michigan researchers working on the use of algae as well as its derivates as a biofuel source for diesel engines will get an aid worth US$ 2 million from Energy Department in the U.S.
As estimated in this report, the global algae biofuel market stood at US$ 4.70 billion in 2017. Witnessing a tremendous rise during the period from 2018 to 2024, the revenue in this algae biofuel market is expected to reach US$ 9.88 billion by the end of the forecast period. The main types available in this algae biofuel market are bioethanol, biodiesel, methane, jet fuel, biobutanol, biogasoline, green diesel, and others. Among them, the demand for biodiesel is relatively higher and the trend is anticipated to remain so over the next few years, notes the algae biofuel market research report. “Thriving transportation activities along with its massive applications in the automotive sector are anticipated to drive algae biofuel market in the years ahead,” says the author of this study. Apart from this, oscillations in the supply of fossil fuels along with volatility in the crude oil costs are projected to boost the algae biofuel market over the coming years. The growing costs of crude oil production, however, can hinder the growth of algae biofuel market over the years to come. Nevertheless, the major manufacturers are investing in the R& D activities to reduce the operating cost, thereby normalizing the impact of hindrances on the market, reports the study. Regionally, North America has been leading the worldwide algae biofuel market and is anticipated to continue on the dominant position in the years to come, states the algae biofuel market study. The expansion of the manufacturing facilities in the countries such as the U.S. is the main factor behind the dominance of the North America algae biofuel market. 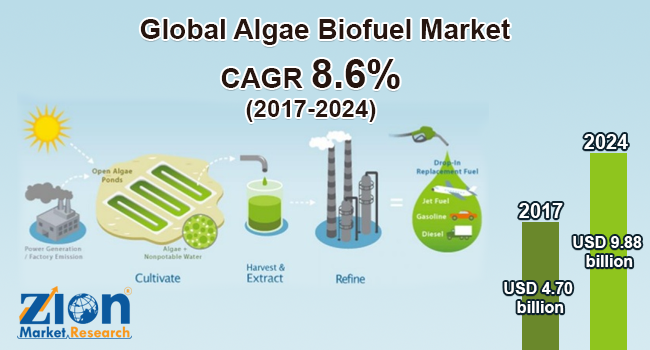 The massive presence of key market players being headquartered in North America is another significant factor that is supporting the growth of this regional algae biofuel market.